According to this article (in Danish), the Danish government is considering a radical price increase for foreign magazines. At the moment, letters and parcels from outside the EU go through customs without any interference if the value is less than 80 Danish crowns (£9). However, if the value is more than £9, it will in most cases be intercepted, and Danish VAT (25%) is added (as well as any other custom duties that might apply); on top of this, the Danish HMRC add a handling fee of 160 crowns (£18). You’ll also need to pick up your parcel from the post office so that you can pay the fee at the same time. The effect currently is that Danes tend to order very cheap products from outside the EU, or very expensive ones, so that the £18 fee doesn’t make up too large a part of the final price. However, the Danes are considering to remove the £9 limit in order to catch also magazines printed abroad. The effect will be that if you buy a magazine sent from the US costing £4 per issue, you’ll now have to pay £4 + £1 (VAT) + £18 (handling fee) = £23, as well as having to pick it up from the post office instead of having it delivered to you. The idea behind the change is to prevent Danish magazines from being printed and delivered from Norway, which seems to happen frequently at the moment (for some bizarre reason that is significantly cheaper than doing it in Denmark). However, whereas these Danish magazines from Norway will just move to some other location within the EU, the real victims of the proposed change will be Danes with special interests that are best catered for by foreign magazines, and especially foreigners in Denmark who are trying to keep up to date with developments in their home countries. I really don’t understand how the Danish government can even consider such a ridiculous proposal. From my point of view it’s insular, xenophobic, anti-intellectual and just plain stupid. The Treasury confirmed that, while it could not block Scotland from using the currency, it could be reduced to a situation where it had no say in fiscal policy, was prevented from printing its own money and was locked out of any valuation decisions. Treasury officials confirmed this would mean Scottish banks, which are licensed by the Bank of England to print their own notes, would be barred from doing so in the event of independence. 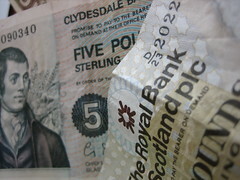 Royal Bank of Scotland, Clydesdale Bank and Lloyds-owned Bank of Scotland are able to print bank notes with the faces of famous Scots, in a long tradition that has been symbolic of Scottish identity. Whereas there’s nothing Scotland can do about being locked out from England’s fiscal policy – but to be honest, it currently tends to cater for the needs of the City of London anyway – an independent country can certainly make its own decisions about printing bank notes. I would recommend creating a Scottish pound after independence, locking it to the English pound using a currency board. This basically means that the Central Bank of Scotland would store English pounds in its vaults and print Scottish pound notes and mint Scottish coins in the same amounts. The advantage – apart from having distinctive Scottish money – would be that it would be easy to break the peg and link the Scottish pound to the euro instead if that was decided to be desirable. If English money was used directly, that would be much harder. Lots of countries use currency boards, and they work really well, so it’s a no-brainer to use one at first, at least until Scotland has been seen to have a strong economy, after which it might even be desirable to let the Scottish pound float freely.